I missed the On The Run tour in person, so coming into this show, I had no original by which to compare it, no expectation other than the greatness that is guaranteed from two such seasoned and exacting live performers. I saw the HBO special, but a telecast cutdown of a stadium show is not the same thing. The truth is that OTR II has to be spoken about as a freestanding concert experience. I counted 20 pieces in the band—but they were moving so much in their choreography, I may be off by a couple members. All dressed in red, playing at a blistering pace to deliver a set list that traverses every genre of Black music from blues, jazz and soul to reggae, pop, gospel and hip-hop, the band was as mesmerizing as the dancers, whose movements echo the same continuum in particular order, but with every ounce of precision. The solo to Nina Simone’s “Four Women” before Jay performed “The Story of OJ,” the showgirl’s rendition of “Freedom” and runway slay of “Countdown” were dance standouts. I must make it absolutely clear however that Beyoncé and Jay-Z are bonafide rock stars—because rock is Black music and rebel fashion. The wardrobe is absolutely stunning from start to finish—but that’s it’s own review. I pray a fashion journalist does one to do the work of Balmain justice. 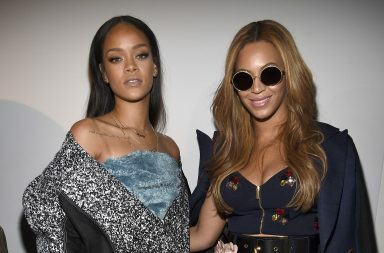 When their duets volleyed between their catalogs, as we saw when “The Takeover” co-mingled with “Ring The Alarm” as they sat backs facing one another in mirrored thrones, this was readily apparent. Bey was head banging. The crowd was snapping their collective neck. In that moment, I imagined Bowie nodding with an approving smirk from above. Masterful use was made of an LED jumbotron screen that calls to mind the one occupying the side of the Marriott Marquis in Times Square. It split in two for hero and shero shots of Jay and Bey. It became one between wardrobe changes (and water breaks for the band I presume) to screen short films, some of Carter family time, others of the power couple metaphorically navigating the ups and downs of love, which can feel like both a blessed baptism…or a burning house depicted on film. OTR II is less the journey of fugitives that it suggests than a musical meditation on the journey of love and marriage. Is it a haven, or is it handcuffing? Is it the learning of lessons and forgiveness, or the practice of surrender and trust? Love is all of the above—and this performance was a relationship playlist for the ages. The Carters served up ample helpings of both their catalogs, performing hits from so many albums. No stone was left unturned: we got a taste of Watch The Throne, sipped Lemonade, and kept time to 4:44. 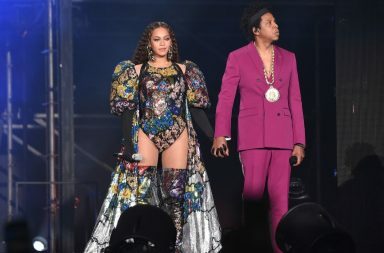 While peppering in bangers from Everything Is Love, the duo even blessed us with a performance of “Nice” among their classic collabos “Drunk In Love”, “Bonnie & Clyde” and “Crazy In Love”. There was even a vulnerability battle. When Beyoncé threw the gauntlet of “I Care”, Jay-Z returned her high-speed power serve with the disarming, haunting melody of “Song Cry”. Mind blown. The romantic was also exquisitely balanced with the political, for love also extends from our partners to our people—and this love can be the hardest to reconcile. Jay-Z made the audience confront this as mug shots of admired and complex figures like Sinatra, Angela Davis, Diddy, Jane Fonda, David Bowie, The Rev. Jesse Jackson, Left Eye and 50 Cent shuffled with his own during “99 Problems”, his anthemic indictment of a jaundiced system and corrupt law enforcement. Beyoncé placed the word FEMINIST across the mega screen then dropped it like it’s hot with her girls on “Sorry”, “Who Run The World” and “Formation”. Because that’s the point: agency over one’s body and its offering in relationships should be up to the person. Feminism is as much about freedom and equality as Black power, and OTR II took that intersectional stand and held it. Woman equal to man. Family first. No human subservient to another because of color, class or background. And as the screen affirmed in the show’s closing moments, “this is real love”. And real love is gangsta.